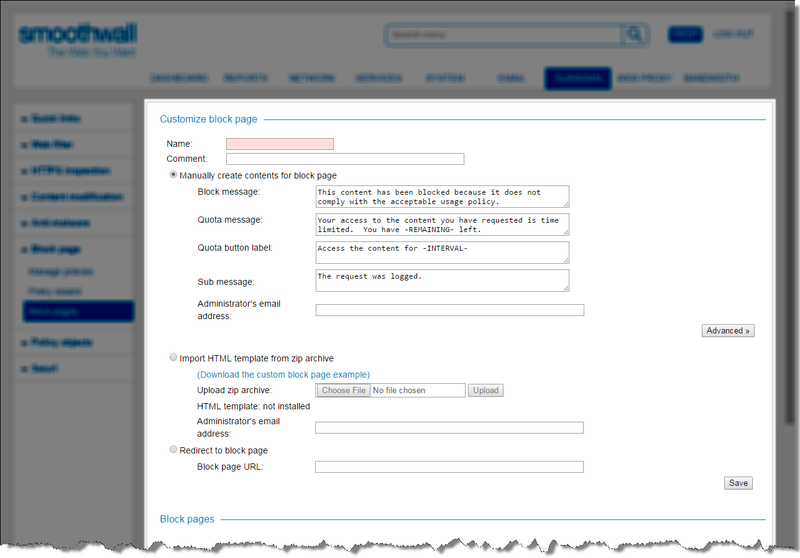 When a user’s web request is blocked, Guardian displays a block page advising the user that they have been blocked from accessing the requested web content. A default web page is supplied, showing information such as which group the user is in, what the blocked content is categorized as, and the computer’s IP address, as well as the reason for the block. This block page is shown if a user attempts to go to a domain listed in the Web Search, Image Hosting categories (for more information about categories see Working with Category Group Objects ). For more information about Guardian content categories, see Working with Category Group Objects . You can add more controls to the block page, or change the text and images to suit your organizational needs. For a detailed description of how to do this, see Customizing the Default Block Page . You can choose to customize the default block page, including the reason for the block, and changing the images. The following instructions also apply if you are creating additional block pages based on the same layout as the default block page. 1. Go to Guardian > Block page > Block pages. • Block message — Either use the supplied text, or enter the default message explaining the reason for the block. • Quota message — Either use the supplied text, or enter the default message shown when a user tries to access content which is time limited. For more information about quotas, see Working with Quota Objects . • Quota button label — Either use the supplied text, or enter text used on the quota button which users must click to start using their quota of time to access the content. • Sub message — Either use the supplied text, or enter a custom, secondary message displayed under the red block banner. • Administrator’s email address — Optionally, enter the administrator’s email address who will be contacted when a request is blocked. • Custom title image — To replace the Smoothwall logo on the block page, click Choose File, and go to the location of the required file. Select the image, then click Upload. installed will appear under Choose File when Guardian successfully uploads the image. Note that the default Smoothwall logo is 218 x 35 pixels. It is recommended you do not exceed this height otherwise the top of the background image may need adjusting. If the supplied background image is retained, the white space at the top may also need adjusting. Ensure you select Enable custom title image from the attributes list underneath. • Custom background image — To replace the supplied red motif on the block page, click Choose File, and go to the location of the required file. Select the image, then click Upload. installed will appear under Choose File when Guardian successfully uploads the image. Note that the outlined box around the central text is 150 pixels from the top of the page. If you are replacing the default image, you must ensure the new image has at last 150 pixels of white space at the top to ensure it appears at the top of the outlined box. It is recommended the image is 800 pixels wide, with the motif centralized within. Ensure you select Enable custom background image from the attributes list underneath. • Show unblock request — Select to display a button on the block page which allows users to request that a blocked page be unblocked. Clicking the button on the block page opens a pop up form which when completed sends the request via the email server used for alerts. Note that if you are creating a customized block page for your tenants, you cannot use this option. Tenants are only available if you have the correct license type and they have been configured on the System > Administration > Tenants page. For information about tenants, see About Multi-Tenant Managed Services . For more information about licensing, contact your Smoothwall representative. • Show client username — Select to display the blocked user’s username, if applicable. • Show email address — Select to display the administrator’s email address. • Show client IP — Select to display the IP address of the user’s workstation. • Show client hostname — Select to display the workstation’s hostname on the block page. • Show user group — Select to display the users group membership, if applicable. • Show unblock controls — Select to display controls on the block page which allow administrators to add domains and URLS to the custom allowed or custom blocked content categories. For more information, see Managing Block Pages . • Show reason for block — Select to display the reason why the web request was blocked. • Show bypass controls — Select to display temporary bypass controls on the block page. These controls allow users with bypass privileges to temporarily bypass the Guardian. For more information, see Managing Block Pages . Note that when an HTTPS inspection policy is enabled (see About Guardian Policies ) and a user visits a site with an invalid certificate, Guardian’s temporary bypass will not work. This is because Guardian must check the certificate before authentication information for bypass can be detected. In this case, bypass controls will be visible on the block page if enabled, but will not work. • Show URL of blocked page — Select to display the URL of the blocked web request. • Enable custom title image — Select if you have specified a custom title image, see above for more information. • Show categories matched — Select to display the filter category that caused the page to be blocked, if applicable. • Enable custom background image — Select if you have specified a custom background image, see above for more information. • Show login button — If the reason for the block is that the user is unauthenticated, you can customize the block page to provide a link back to the login page. Valid options are: SSL login, Non-SSL login (which is the default option), Disable. To take advantage of the login button, Core authentication must be selected as the Guardian authentication policy — see Creating Authentication Policies. At least one directory server must also be configured on the Services > Authentication > Directories page — see About Directory Services . 5. Click Save to save the block page and make it available for use in a block page policy. You can create your own block page, created in HTML. Guardian provides a custom block page template for your use. 2. Download the block page template by clicking Download the custom block page example. Guardian downloads a zip file for your use. 3. Update the template as required, and save it in a zip file archive. Ensure all files needed by the custom block page are included in the zip file, and that the archive’s location is accessible by Guardian. 4. Go to Guardian > Block page > Block pages if you have navigated away. • Name — Configure a meaningful name for the block page. • Comment — If required, configure a comment for the block page. 6. Select Import HTML template from zip file. 7. From Upload zip archive, click Choose file. 8. Locate and select the custom block page archive. Guardian unpacks the archive, and makes it available for use in a block page policy. 10. If required, enter your system administrator’s email address to receive unblock requests. Guardian enables you to specify an external page as a block page. • Select Redirect to block page to enable Guardian to use an external block page. • Block page URL — Enter the block page’s URL. 3. Click Save to make it available for use in a block page policy.